William Martin acted as CDM Co-ordinators for this project as part of their framework for the Homerton University Hospital NHS Foundation Trust. Installation of a new lay in grid suspended ceiling complete with radiant panels, light fittings and diffusers, below the existing ceiling. Re-arrangement of existing bathroom/shower/toilet facilities in the ward. Modifications to the existing bed-head trunking, containing medical gas and power supplies, and the running of a new nurse call system throughout the ward. Modifications to the existing air conditioning system, including forming 2 no. new penetrations through the pitched tiled roof above. The roof tiles contained asbestos. Upgrading existing glazed screens with Pyro glass to meet current fire standards. 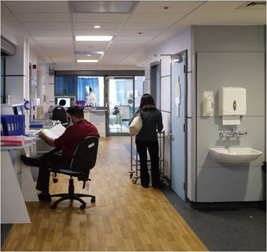 The work was undertaken with adjoining wards in the building fully occupied.